Image caption Mr Vizcarra (C) said Peru intended to "defend its territory"
Security forces in Peru have arrested more than 50 people in the isolated jungle region of Putumayo in the first week of a 60-day state of emergency. 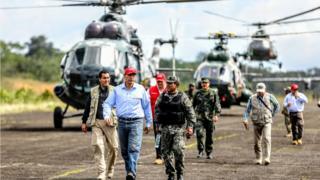 President Martin Vizcarra said on a visit to the region, on the border with Colombia and Ecuador, that four drug production facilities had been found. He said most of those detained were from Colombia. Peru has said it fears that dissident Colombian Farc rebels are trying to establish a presence in the region. The operation followed a series of attacks by Farc rebels on security forces in neighbouring Ecuador. More than 350 members of the Peruvian police and armed forces used five helicopters, three planes and two boats in joint operations with their Colombian counterparts in the area, reports said. "We're firm, we're clear, we're going to defend our sovereignty and our territory," Mr Vizcarra said. The Colombian government agreed a peace deal with Farc rebels in 2016 after more than 50 years of conflict. However about 1,200 Farc fighters have refused to lay down their arms and have carried on drug trafficking activities, the Colombian authorities say.